KAMPALA– The Commissioner General of Prisons, Johnson Byabashaija has said the prisons service in the country is still faced by congestion of inmates despite a distinguished rise in the prison holding capacity. The commissioner made the revelation while appearing before the Parliamentary Committee on Defence and Internal Affairs headed by the Minister, Obiga Kania with a statement highlighting the Budget performance evaluation for the financial year 2017-18. Byabashaija told the committee that whereas the country population is growing at 3.4 percent per annum, prisoner population is growing at eight percent per annum. Byabashaija added that the country has a total of 254 prisons with carrying capacity for a daily average of 17, 280 prisoners while the population is 54, 538 as recorded in September exceeding the holding capacity by 37, 258 inmates. “By the end of FY2018/19, the prisoners population is projected at 59, 641 and the holding capacity will be exceeded by 42, 361,” Byabashaija highlighted. 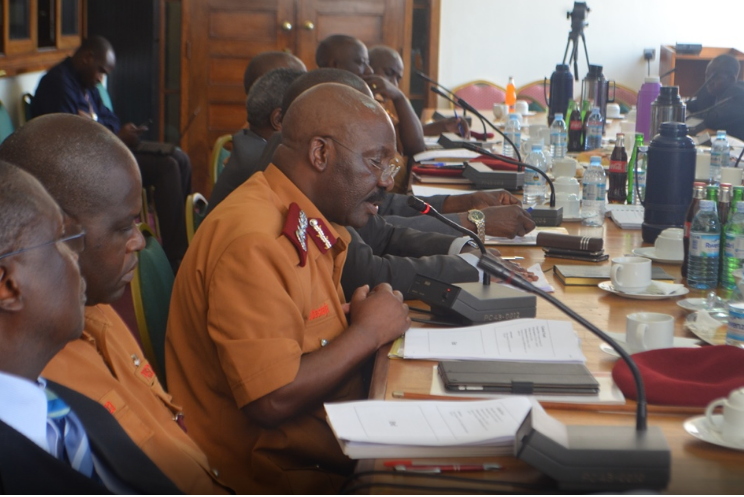 The prisons officers, however, noted that there have been a notable prisons holding capacity which has increased in the financial year under review by 668 from 16, 612 to 17, 280 prisoners. The Upper prison has a capacity of 756 but with a population of 3, 190, Masindi (M) with 262 with population of 1, 222, Lira, Capacity of 121 with a population of 679, Logore, capacity of 250 with population of 880. They have explained that the congestion is partly explained by the length of stay on remand for capital offenders increased from 18.7 to 19.8 months and for petty offenders increased from 2.0 at 2.5 months due to judicial strike. They have also suggested mitigation measures which include; strengthening collaboration with actors in the criminal justice system, exploiting the use of non-custodial sentence, exploring the use of parole and license to be at large as well as Plea Bargaining.